This ferry was part of a round trip that we took, from Zadar to Biograd (by taxi), then we took a ferry over to T'kon on Pasman island, and then caught a bus to Preko on Ugljian island (which is connected to Pasman by bridge), where we caught a ferry back to Zadar. 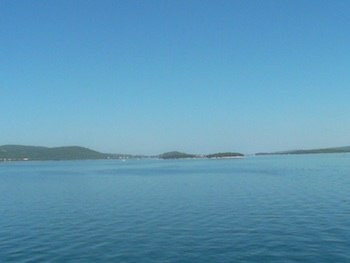 Even if you were just to take a ferry from Zadar to Preko, and then return, the view would be impressive, but I have to say that I think it would be worth getting the bus to Biograd to do this short ferry ride that only costs a few pounds. We ran up to the very top of the ferry, and the views as we crossed the water were out of this world. We passed the small near islands, and looked out towards misty karst islands in the distance, with white sailboats floating past us, their wakes softly rolling for miles afterward as the waters were so calm. 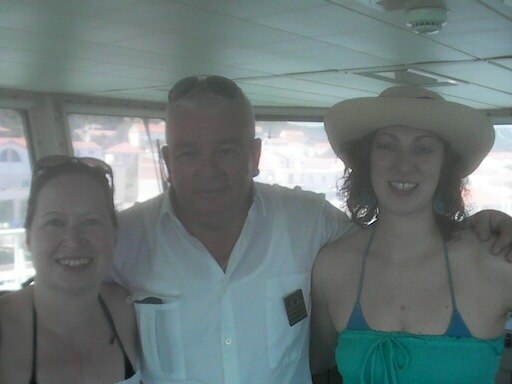 The crew were so lovely - the captain, Peter, even came out to bring us some cherries, and then invited us into the bridge to watch him driving the boat into dock and take photos! And then we were in T'kon, a tiny little town with four or five bars and restaurants, and... that was about it. We stopped for a quick drink and then tried to find out when the bus would be leaving. And that's when we found out that at 11.30, we were going to have to wait for the bus at 2.45pm! Although the ferries run frequently during the day, be very careful that you know the bus schedule in advance as these can stop for 2-3 hours in the middle of the day. If you do find yourselves stranded in T’kon you can always try our little castaway beach. Just go left as you arrive in from the ferry - and hopefully it will still be deserted! £2-3 each, one way from Biograd to T’kon.